We found this wonderful small solid Oak, Flemish Style Chair on our most recent "Tuesday" Antique shopping venture! We've never seen a chair like this, with it's "Mortise & Tenon" construction, the back is held in place with a peg through the tenon behind the seat. This chair also had fine detail of turned wood legs, a heart cut out and a floral motif adorning the seat & back is burned (Pyro-art) into the surface gives this it's "Flemish Style". The Flemish Art Company(at the turn of the century and into the 30's) was famous for this type of decoration on furniture, keepsake boxes, letter boxes....just about anything made out of wood, thus any item with this type of decoration is commonly referred to as "flemish style", although items actually made by the Flemish Art Company will have a company stamp burned into the piece. This little chair would be at home on the hearth, in a bedroom or that special corner in your home or cabin! It has been some time since we've taken photographs around the Lakehouse. Here are a few snapshots of some new finds. Let us know if something catches your eye! Another "Tuesday Find"..this Great Vintage Carved "Wind Spirit" Arm Chair! Perfect as a capitains Dining chair or a stand alone occasional chair, this Unique Vintage solid English Oak chair is carved with this wonderful "Wind Spirit"! We've re-upholstered the seat with a Ralph Lauren Cordoroy to fit into any Cabin, lodge or Tudor style home. This chair would be right at home next to a fireplace as well as in your home's Pub or Library. 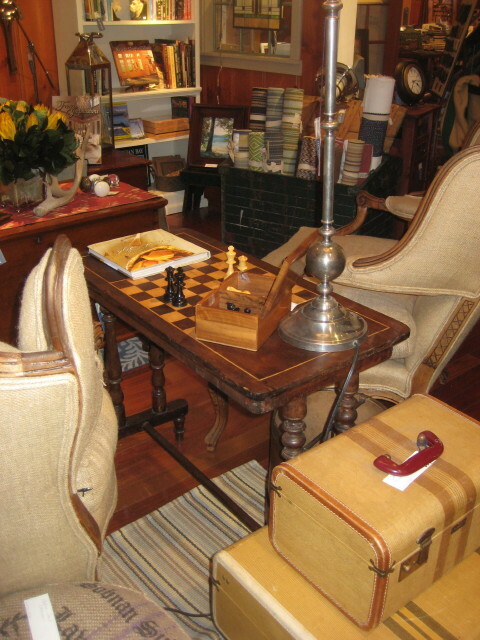 This Week's "Tuesday Find" is a Wonderful Vintage Mahogany Game Table with Inlaid Checker Board! 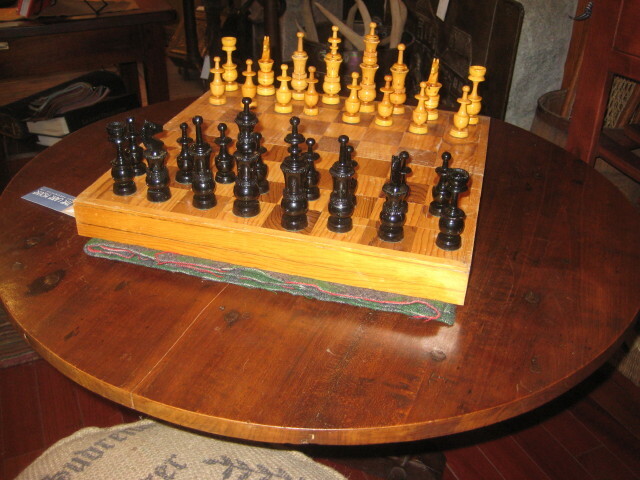 This great little 17" table is perfect for a small corner and that quiet game of chess or checkers! 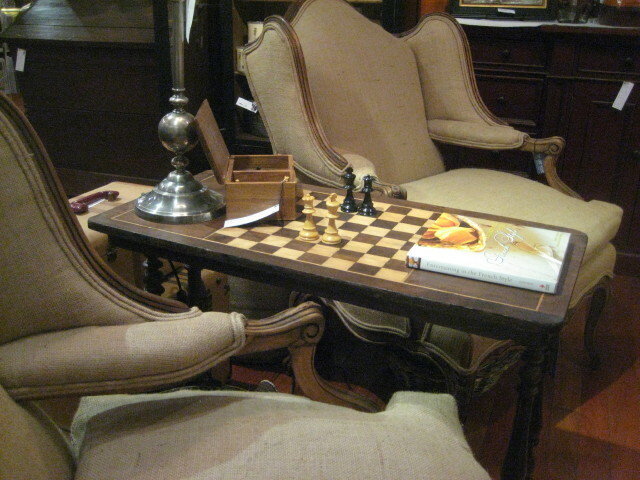 The top has a beautiful "burl like" grain in the mahogany with a checker board inlaid with what appears to be Oak & Walnut. The pedestal with three feet was added to this table top...definately not original, although the two seem to work well together! If you're not one to play Chess or Checkers, this would function well as a lamp or side table. The Latest "Tuesday Find"...a fabulous 1930's Wicker & Walnut Dining Table & Six Chairs! This Dining Set is unlike anything we've ever seen! Freshly painted and reupholstered chairs, make this vintage set look almost new. If you have a screened in porch or veranda this is the perfect set for you! We picked it up on our antiquing travels on Tuesday, and put it in the store on Thursday...we already have three customers interested! This is really the ulimate "Tuesday Find"! We've found other wonderful vintage pieces recently, but have been negligent about getting photos posted! Business is definately picking up and there seems to be a renewed energy here at the Lake! I'll try to post more often to keep everyone up to date on the fun new items we get in. 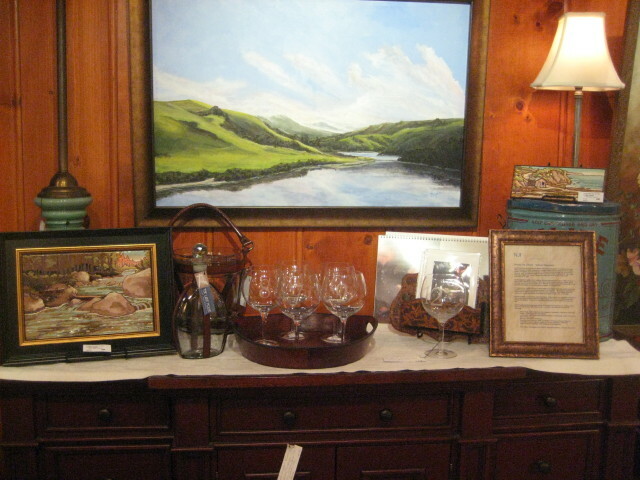 Don't forget to join us for our "First Friday" Art Open house on August 5th! 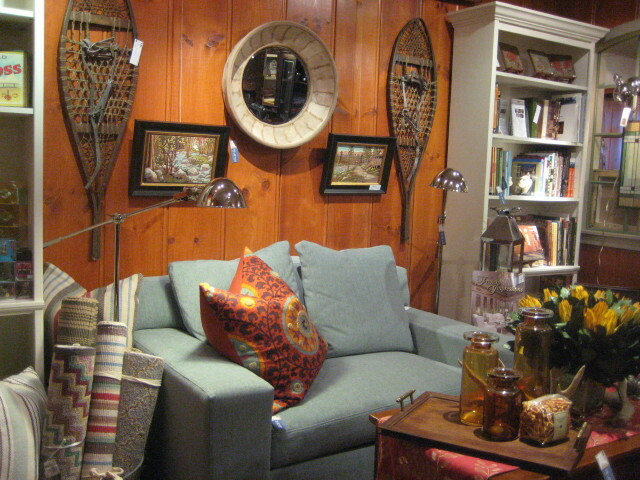 Fabulous Adirondack Style side table is our newest "Tuesday Find" at The Lake House! This wonderful Vintage "Adirondack style" twig side table can stand alone as a piece of Art with it's whimsical original paint! We pick up interesting little tables pretty regularly, but this is unlike any other we've ever come across! This little gem would work well in a cabin, lodge or as the perfect "suprise" piece in a cottage.